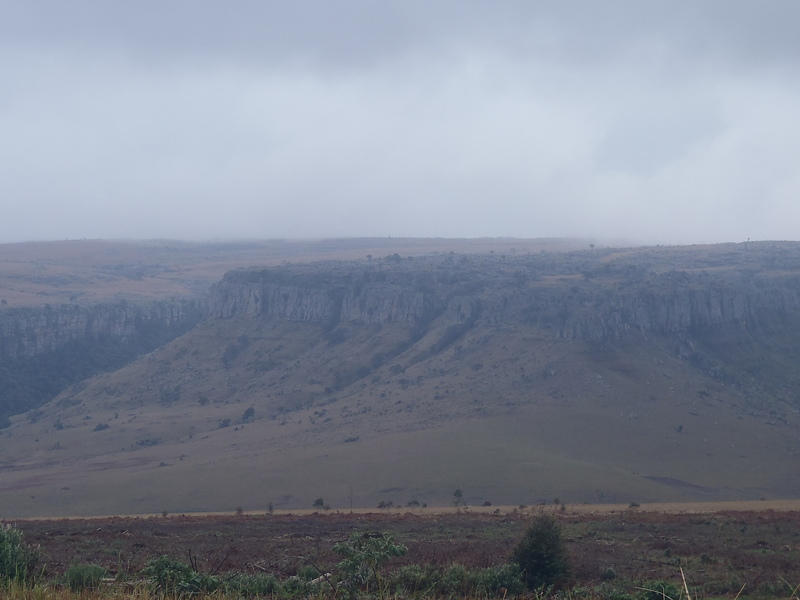 On my second day in Mpumulanga, I decided to have a bit of a lie-in and take the Panorama Drive. It was a little unfortunate, as the weather chose to hide a number of the panoramas. It had rained over night and remained overcast most of the day. As the panorama drive involves driving up some hills and to the edge of the Mpumulanga escarpment, I saw the inside of quite a few clouds. I turned towards Graskop from Hazyview and from there turned north. This part of the province appears to be timber farming. There are swathes of Ecalyptus forest dotted with sections where there had been recent felling. At the side of the roads, logs were piled up or being stripped branches and cut to size. Emerging from the forested bits I encountered some of the vastest views. I stopped on a couple of occasions to take pictures of where the plateaux just fall away down a sharp cliff, at the bottom of which there is just further pasture. I was a little surprised not to see any evidence of sheep or cattle farming, however there could well be hyenas roaming around at night making the idea of livestock holding a bit unsuitable. Having turned off to see God’s Window, a panoramic view from the edge of the large escarpment, I entered cloud. I carried on along the road, past the turn-off to see the Pinnacle and God’s Window. Having only just been able to make out the signs to them in the mist, I carried on along the road – I wasn’t going to see the view… I descended a bit and came back out of the cloud to join the main road again. With hindsight, I wish I’d taken my altimeter with me to be able to tell where exactly the cloud base was and what sights were worth pursuing and which ones weren’t. Travelling north again, I stopped off at the Berlin Falls. 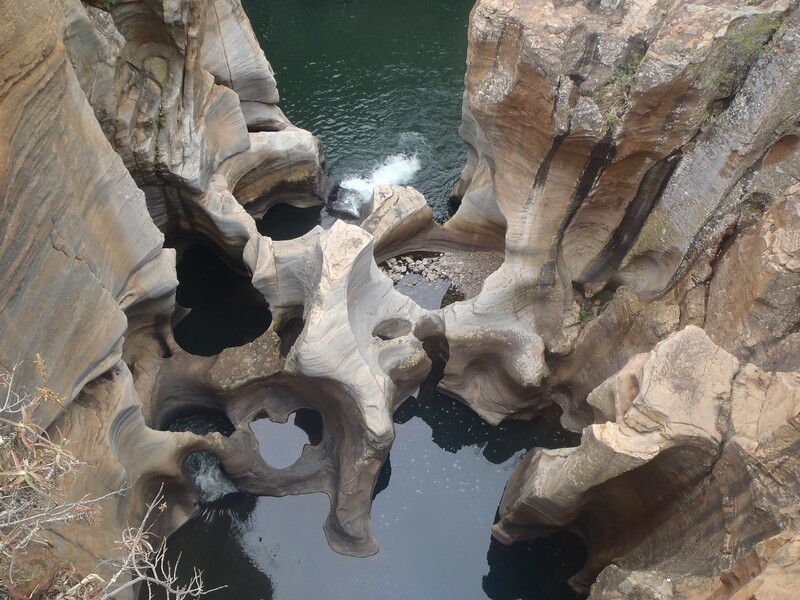 These falls are 80 m high and the Watervalspruit plunges down a cliff into a huge green pool. There is an observation platform from which you can take pictures. Despite my terrible fear of heights, I did manage to walk right up to the edge of the railings and even held my camera over the edge to take some pictures. Fortunately there were kind ladies selling souvenirs back by the car park so with a bit of retail therapy I managed to calm my nerves again. Laden with nick nacks I got back in my car and carried on further north, to Bourke’s Luck Potholes. These ‘holes’ are named after Tom Bourke, but were not made by him. Rather, they were created by the meeting of two rivers, the Treur and the Blyde. The swirls and eddies from the joining of these two waterflows over sand stone resulted in the most spectacular shapes carved out of the rock. There are a number of bridges which have been built over the canyons created by the water and despite the weather, I think my pictures turned out relatively similar to those on the post cards. 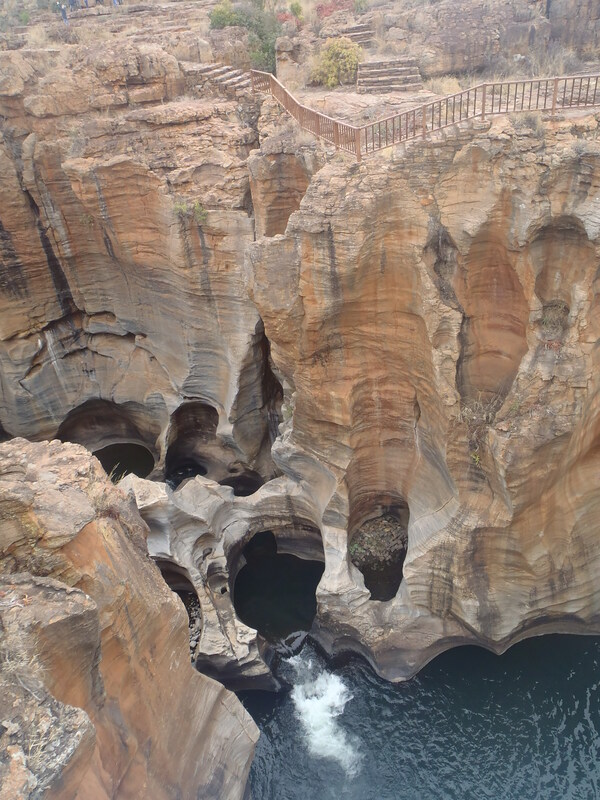 Apart from the bridges, no railings have been erected into the rock, there are a few signs suggesting the extent to which normal tourists may want to go. On my return to the picnic area further away from the gorge, I contemplated driving another 30 minutes north to see the three Rondavels. In view of my past luck with cloud base and visibility, I decided that the pictures on the post cards would have to do although I already knew that no picture can ever really do the stunning scenery justice. Even overcast, the mere size of the land and the insignificance of each individual human being is breathtaking. And I was driving on a main road! So I turned back south drove past Berlin Falls again, and this time stopped off at Lisbon falls. I guess it demonstrates the proximity in which the respective colonists lived, that Berlin and Lisbon falls are only a few kilometres apart from each other whereas Berlin and Lisbon are many, many kilometres and a couple of cultures apart. 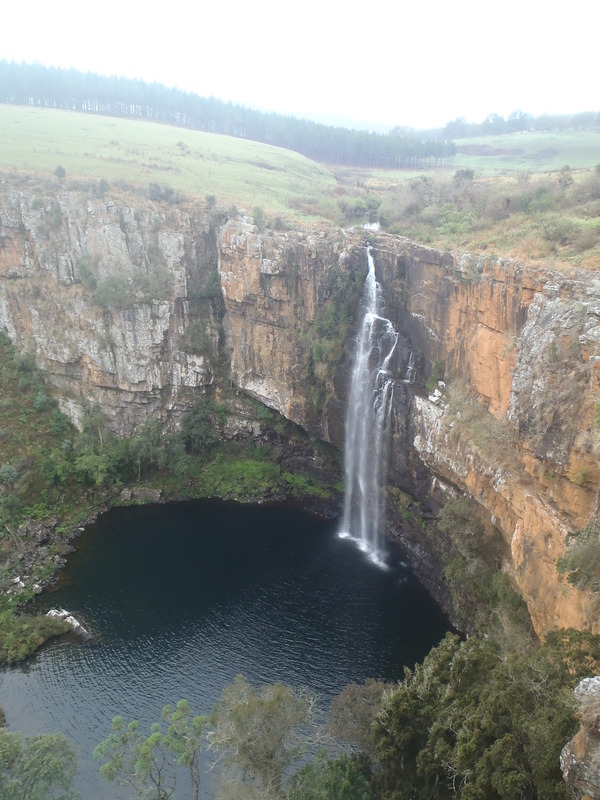 Lisbon falls is made up of three separate streams of water all plunging 92m into a pool. The river splits into these three prongs at the top and then cascades over the edge. There is a poor trail I could have followed to get down to the bottom, but decided that as I was by myself and the bad weather was keeping many tourists away, I didn’t want to risk going down there and not being able to get back up, or falling and getting hurt when there wasn’t anyone to get help. For a second time I drove around the loop to see God’s Window, but once again, the curtains of cloud were drawn and I concentrated hard to drive out of the fog and back south to the comfort of my hotel. 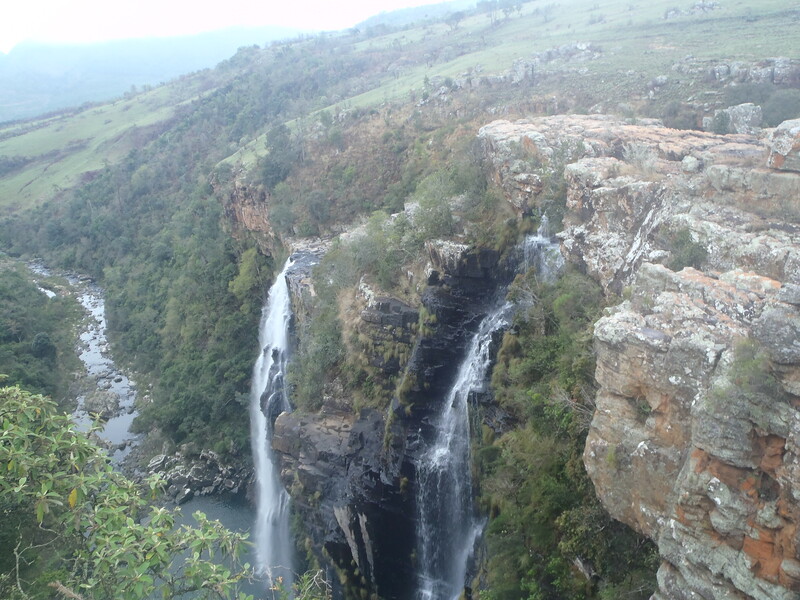 Having not seen these views or scrambled down either of the falls, I am already working out when I’ll be able to return to Mpumalanga!